(a)	To replicate natural conditions of infiltration, evapotranspiration, and runoff. In typical natural conditions, approximately 50 percent of stormwater infiltrates, 40 percent leaves land through evapotranspiration, and ten (10) percent leaves the land as runoff. (b)	To promote decentralized stormwater management systems modeled after natural hydrologic features and infiltration practices that facilitate local groundwater recharge [Low-Impact Development (“LID”) techniques]. (c)	To promote water conservation and efficiency through stormwater capture, treatment and reuse. (a)	All Applications, regardless of whether the project is subject to the Wetlands Protection Act or not, shall design the stormwater management system in compliance with the Massachusetts DEP Stormwater Management Standards, January, 2008, as amended (“SMS”) and the Massachusetts Stormwater Handbook, February 2008, as amended (“Handbook”). The Applicant shall submit a completed and endorsed Stormwater Management Form that indicates compliance with the SMS, in addition to any supporting calculations indicating compliance with the required standards. http://www.mass.gov/dep/water/laws/policies.htm#storm. The Handbook which includes the SMS, Stormwater Best Management Practices, Documenting Compliance, Stormwater Report Checklist and TSS Removal Calculation Sheet. Devens Stormwater Pollution Prevention Plan (Stormwater Plan). Devens Water Resources Protection Report. (c)	Where there is a conflict between the requirements set forth below and the Handbook and/or Plan, the Plan and the requirements below shall govern. There shall be no negative impact from stormwater runoff on abutting properties and to any public or private water supply or designated potential future supply. Irrigation water shall be derived from detained treated stormwater (stormwater harvesting), or roof drainage to the maximum extent feasible. On-site cisterns may be installed to store water for irrigation. For all stormwater improvements, drainage calculations shall be prepared by the Applicant's Engineer in accordance with the SMS requirements and shall include design criteria, pre- and post-development drainage areas, and other information to verify the size and effectiveness of the proposed stormwater management technique. "Pre-development" drainage areas shall be considered to be "green fields" regardless of any development or improvements on the site at the time of application. Calculations shall be made separately for each drainage facility, showing its location, the total upstream drainage area, the underlying soil types and the flow paths for the times of concentration, the design runoff, facility size, slope, and capacity and velocity of water through all the site drainage system. Proposed activity that will temporarily or permanently disturb any land area at or below the elevation of the 100-year floodplain shall be avoided to the maximum extent feasible unless there are exceptional circumstances where such areas cannot be avoided. Under such circumstances, the Applicant shall demonstrate, to the satisfaction of the DEC, that there shall be no temporary or permanent loss of flood storage area. For any areas within the 100-year floodplain where the DEC authorizes disturbance, temporary stabilization measures shall be implemented at all times, until permanent stabilization is achieved. No construction laydown areas or equipment shall be stored within the 100-year floodplain without emergency removal/relocation measures in place and approved by the DEC.
Recharge may not be required for land designated as an Area of Concern, if, according to the Base Closure Team in accordance with Base Realignment and Closure Act requirements, recharge will negatively impact ongoing environmental remediation. All projects shall incorporate LID techniques for stormwater management to the maximum extent feasible. For projects proposing traditional closed drainage systems, the Applicant shall demonstrate to the satisfaction of the DEC why LID stormwater management design methods are not feasible. For LID stormwater controls not referenced in this section (974 CMR 4.08) or the Handbook, or for which pollutant removal rates have not been provided, the effectiveness and pollutant removal of the structural control must be documented through prior studies, literature reviews, or other means and receive approval from the DEC before being included in the design of a stormwater management system. 1. Any low-flow outlets shall be designed to prevent clogging. (b) In addition to compliance with the SMS, the post-development peak rate of stormwater discharge off-site shall not be greater than the pre-development peak rate of stormwater discharge for the 2, 10, 25, 50 and 100-year storm events from any point of discharge on the site. (c) There shall be no stormwater structures and/or point source discharges within 25 feet of the boundaries of any Resource Area unless the Applicant can demonstrate no adverse impact to the Resource Area. (d) Side slopes above the design water level shall be 3:1 (horizontal to vertical) or flatter and conform to the slope of the existing topography without abrupt or unnatural breaks in slope, unless otherwise permitted under 974 CMR 4.08(4). (e) Banks of wet ponds, swales not within maintained landscaped areas (such as lawns or parking lots), and other channels shall be vegetated with native woody plant material within ten feet of the high water elevation and with herbaceous plant material at the edge of the pond at the high water elevation. Trees shall not be planted on fill embankments. (f) Shelves below the design water level (as described in the Stormwater Plan) shall be vegetated with hydrophytic native plant species at a density needed to establish full coverage by the next growing season. Plant plugs or pre-vegetated coir-mesh blankets or carpets are recommended materials. (g) Recommended post-construction erosion control methods include geotextile and /or biodegradable erosion control fabrics staked or anchored to the slope, with loose weave to allow vegetative cover to be established. Vegetative cover shall consist of native woody plant species installed as live brush or nursery stock, or native grasses. (a) Minimize basin size to 5,000 square feet per basin or less (by using smaller catchment areas and/or alternative stormwater management design methods) and minimize disturbance to natural or re-established vegetated areas to the maximum extent feasible. If a basin exceeds 5,000 square feet, the Applicant shall demonstrate to the satisfaction of the DEC why a smaller size is not feasible. If a basin is a constructed stormwater wetland, it may exceed 5,000 square feet upon approval by the DEC. Constructed stormwater wetlands shall be designed in compliance with the SMS. (b) Be located in naturally occurring low spots. Layout of the basins shall complement the natural topographic movement of the site [see 974 CMR 3.08(4) Figure D)] Rigid basin layout [see 974 CMR 3.08(5) Figure E] shall be avoided in all instances unless the basin's layout complements the overall design concept of the Site Plan. (c) Utilize banks steeper than 3:1 (horizontal to vertical) only to tie into headwall/outfall structures. Banks steeper than 3:1 shall transition to slopes of less than 3:1 as quickly as possible to minimize areas of potential erosion. Specific post-construction erosion control methods shall be detailed to ensure temporary and permanent stabilization of such areas will be achieved. Rip-rap/trap rock solutions shall not be acceptable, except as water dissipaters below storm water outfalls or as channel liners for steep swales. (d) Have an emergency outlet to accommodate storm flows in excess of the 100-year storm event. A minimum 1-foot freeboard distance shall be established between the 100-year flood elevation and the top of embankment. (e) Design basins/infiltration structures using the Natural Resource Conservation Service TR-20 methodology in accordance with the SMS. (f) Locate the floor of all basins/infiltration structure/swales a minimum of four feet above the high groundwater elevation. High groundwater testing shall be conducted before the basin design at the proposed location of each basin in compliance with Title V (310 CMR Section 15.103), as most recently amended or reliable data pursuant thereto shall be provided. (g) Conduct a falling head soil permeability test in retention/infiltration basins before the basin design in all basins and infiltration structures. Soil with a percolation rate of 2 minutes per inch or faster can be used to confirm the first NRCS Hydrologic Soil Group A with a Texture Class of Sand and an infiltration rate of 8.27 Inches per hour from the Rawls, et.al. table in the SMS. To use infiltration rates faster than 8.27 inches per hour, use 50% of the infiltration rate obtained from the falling head soil permeability test. (h) Conduct percolation tests in detention basins before the basin design and shall be conducted in compliance with Title V (310 CMR Section 15.105), as most recently amended. (i) Include fencing and/or screening of stormwater detention/retention basins if the DEC determines that safety or appearance require such measures. (a) Vegetated Roofs - shall comply with the Handbook and the DEC Policy for Construction of Vegetated Roofs dated August 2011, as amended. For the purposes of stormwater management system design, the area of roof covered by vegetation may be considered pervious and subtracted from the total proposed impervious area. Vegetated Roofs within the Viewshed Overlay district shall comply with 974 CMR 3.04(8) (i) 5 and 6. Landscaping plans for projects incorporating vegetated roofs and/or walls shall show the design and location of vegetated roofs and walls. Lined on the sides with a non-woven geotextile fabric to prevent influx of fines (no liner on bottom). A gravel trench surrounding the edge of the pavement connecting to the stone reservoir below the surface of the pavement may be required as a backup in the event of surface clogs. Installed by a qualified contractor with experience in permeable paving installation. 1. Top layer: 6 inches of pervious concrete placed in two 3-inch courses. 2. Second layer: 4 inch course consisting of 1-1/3 inch crushed stone (structural support). 3. Third layer: 14 inches of open graded “bank run gravel” (Reservoir base). 4. Fourth layer: 6 inches of 3/8” crushed gravel (Capillary barrier). Alternative comparable reinforcement methods will be considered by the DEC on a case by case basis. (a)	LID swale systems shall be utilized in parking lots not subject to truck traffic, truck and container storage, and other railroad related vehicles/equipment, to the maximum extent feasible. (b) Closed Drainage Systems (CDS) and swales shall be designed to accommodate the 25-year storm event based on the Rational Method without surcharging. The CDS shall be designed in accordance with the SMS. 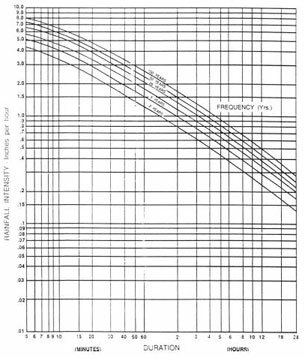 Intensity/duration/frequency curves for the Worcester area, as presented in Technical Paper 40 of the National Weather Service and the Massachusetts Hydrology Handbook for Conservation Commissioners, March 2002, as amended, shall be used in the drainage design calculations. The minimum time of concentration shall be five minutes. (c)	All drainage structures shall be constructed of pre-cast concrete. (d)	Catch basins shall have oil traps and provide a four-foot sump. (e)	Details for all drainage structures shall be provided. (f)	Flow capacities shall be calculated, using two feet per second (fps) minimum velocity and 10 fps maximum velocity under a 2-to-25 year design storm event. The designer shall account for partial pipe flow capacities, if applicable to the design. (g)	Catch basin to catch basin connections are prohibited in paved areas. (a) The name(s) of the owner(s) for all components of the system. (b) A statement that the Applicant is responsible for the operation and maintenance of the entire on-site system. Parking Lot Sweeping: with mechanized cleaning equipment on an annual basis. Catch Basin Cleaning: Catch Basins and Infiltration Chambers shall be inspected on a bi-annual basis. Any sediment accumulations in excess of half of the unit’s sump depth shall be removed. Material shall be removed by a licensed contractor, who shall be responsible for disposing of the material off-site in a manner consistent with all local, state and federal regulations. Infiltration Swales: Ensure proper establishment of full vegetative cover. Swale embankments and side slopes must be properly maintained to ensure long-term stability. Annual and seasonal inspections are required to ensure a healthy groundcover is maintained to avoid erosion and promote infiltration. Bare spots shall be repaired and planted with native ground cover material. Saplings and large shrubs shall be removed to maintain integrity of the swale. Level spreader shall be inspected seasonally to remove any build up of sediment and ensure proper drainage flows. Detention/Retention Basin Inspection and Maintenance: Wet and dry basins shall be inspected annually to ensure inlets and outlets remain unobstructed. Inlets and outlets and forebays shall also be inspected for potential sediment, erosion, cracking, tree growth, damage to the emergency spillway and erosion within the basin and on within the banks. Upper side slopes, embankment and emergency spillway shall be mowed annually. Any tree saplings shall be removed. Accumulated sediment shall be removed as necessary and at least once every ten years. Bare spots shall be repaired and planted with native ground cover material. Biofiltration Systems: Quarterly inspections for accumulated sediment shall be performed. Debris, sediment accumulation, erosion shall be removed/repaired at least twice a year. Any dead or damaged plantings shall be replaced. All invasive species shall be removed on an annual basis. Re-mulch any void areas by hand. Native grasses and plants shall be maintained by hand without the use of fertilizers and limited use of organic herbicides. Trimming of surrounding grasses shall be restricted to a minimum of 5 inches. When cation exchange capacity of soil media decreases, the soil media shall be replaced to prevent contaminants from reaching the groundwater. Sediment Trap/Oil-Water Separator: Shall be inspected annually for sediment and debris accumulation. Any sediment accumulations in excess of half of the unit’s sump depth shall be removed. Material shall be removed by a licensed contractor, who shall be responsible for disposing of the material off-site in a manner consistent with all regulations. Sub-Surface Infiltration Systems: Shall be inspected annually for proper function and sediment accumulation. Accumulations of sediment and/or materials that negatively impact the infiltration capacity of the system shall be removed. h.	Accumulation of sediment in the forebay and micropool; and survival rate of plants (cells with dead plants must be replanted). Sediment forebays must be cleaned annually. 3. Receipts for maintenance performed. For ease of reporting, the DEC and MassDevelopment have created standard annual reporting templates for use by all Applicants. Failure to submit the required annual report is a violation of the Unified Permit.